As part of the transition from Downtown Disney to Disney Springs, the Planet Hollywood restaurant is becoming a “four-story stargazing observatory” called Planet Hollywood Observatory. Set to debut in spring 2016, the reimagined Planet Hollywood Observatory will feature a newly-expanded outdoor terrace and bar, a refreshed menu, new merchandise, and celebrity partnerships. The new outdoor terrace and outdoor bar will be called Stargazers, featuring live entertainment with music inside via DJ performances. Renovations will begin early next year, transforming the exterior into a turn-of-the-century design aesthetic while updating the interior with spherical planet-shaped lighting fixtures. A rendering was released today depicting what the outside of the restaurant will look like when complete. I love it! Awesome and I can’t wait! Thank goodness. That thing has been out of date for some time now. OMG! That will be look so old-fashion look! And I wonder if Planet Hollywood will eventually be at Universal theme parks and resorts as well. I do really saw some props and references of films that are owned and produced by Universal Pictures. What would you think of that? USF Citywalk already has a deal with the country’s biggest Hard Rock Cafe (and Hotel), so I’d doubt they’d let the competition in any time soon. But I like the attempts to rework the old “corporate” DTD into Disney Springs–Wonder what’ll happen to the AMC Theater? LOVE IT! 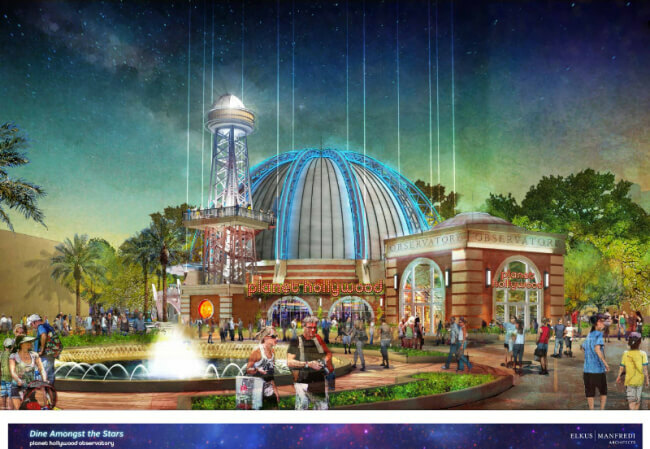 Glad they’re keeping Planet Hollywood!